On July 20th, I moved my personal blog site, robpickering.com from SquareSpace to WordPress. This article is about why I did it and then how I performed the task, maintaining all of my posts, post dates, migrating authors, and most importantly, keeping all of my user comments. I’ll also discuss some of the downsides and what you’ll lose (and how to get it back). SquareSpace is a great personal website hosting company. They have an amazing platform and lots of options for building yourself a web presence, be it a blogging platform, or just a standard website. However, those tools come at a price: the inability to have complete control over your environment. If their tools cannot do something you want, then you can’t do it. If you want a certain widget (say a Tag Cloud) on your blog, forget it, there is no Tag Cloud widget. Want to add Mint analytics to your blog? Or any analytics besides the built in SquareSpace ones? Probably not without a lot of work. After a friend of mine asked me to solve a problem he was having with SSH support in WordPress, I found out that I liked the platform. So, I setup a WordPress installation and began configuring it for my personal blog. I eventually decided I liked it better than SquareSpace and tried to figure out how to move it. SquareSpace does an excellent job in supporting a variety of ways of getting your site INTO their platform. However, the support for leaving their platform is a bit limited, but can be made to work with some effort. The first thing you’ll want to do is export all of your content. SquareSpace names each of your Blog pages a Journal. You can have multiple Journal pages on a site, each with its own navigation tab. Unfortunately, each Journal has to be exported individually. I figured that the place to look for exporting your data would be under the Website Management area, probably under Data & Media. There’s even a Data Snapshots selection. Unfortunately, that’s just for making a backup of your data, a dead end. This will download a .export.txt.html file, which is actually a Moveable Type formatted HTML file representing your Journal page, including Content, Authors, and Comments. 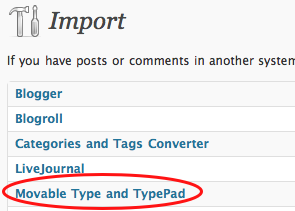 Now that you have your Journal exported, it’s time to import it into your WordPress site. The only preparation you have to perform, prior to importing your Journal, is that any authors you had on your SquareSpace site should be created BEFORE you import your Journal. However, WordPress will prompt you for author mappings when you import, so you could just assign all posts to your main account then update the posts after the fact. Alternatively, WordPress **WILL **automatically create new accounts for you as it imports, if you want. That’s better than SquareSpace will do for you. None of your images/media have been exported or imported. This isn’t an insurmountable task, but you’ll have to manually download all of your media from SquareSpace, and then manually re-upload it into your Posts in WordPress. Fortunately for me, I have a Macintosh, so I just dragged each of my images out to my Desktop, then re-uploaded them into my articles. This is by far the worst part of the process, so I’m open to other suggestions folks may have. Note: It may not appear that your Posts are missing images. This is most likely because the images are being loaded from your old site, as the references are still pointing there. You can leave this alone, but once you move the domain name, they’ll most likely break. So, re-uploading is your best bet.